In war-torn countries around the world, thousands of rough men stand ready to do violence on behalf of those unable or unwilling. They are equipped with the most advanced military technology available: assault-rifles with holographic and laser sights, night vision goggles, body armor, and encrypted radios. They maneuver through war zones in a wide array of armored trucks, helicopter gunships, and high-speed attack boats to accomplish their missions. These grisly men with their beards, dark sunglasses, and civilian clothing give off the hint of some elite special operations unit. Only these men are not soldiers, at least not in the traditional sense. They are contract warriors—soldiers for hire, employed by a legitimate business with a new take on an age-old profession. 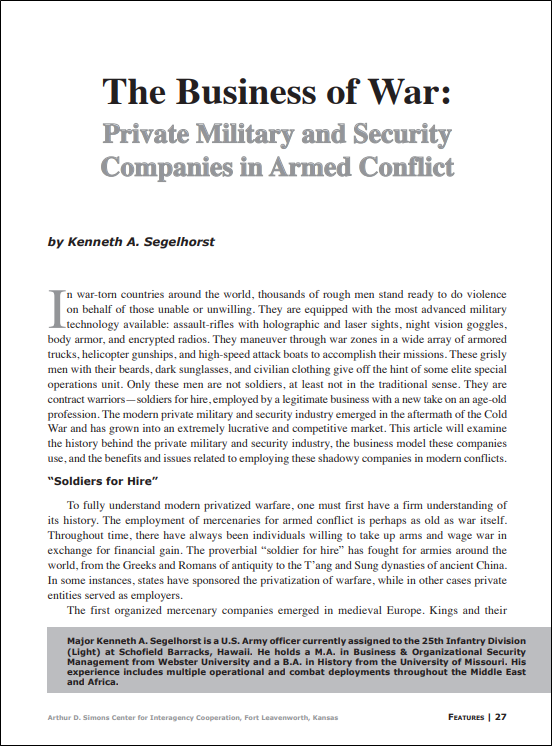 The modern private military and security industry emerged in the aftermath of the Cold War and has grown into an extremely lucrative and competitive market. 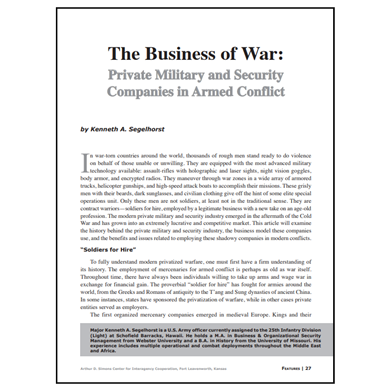 This article will examine the history behind the private military and security industry, the business model these companies use, and the benefits and issues related to employing these shadowy companies in modern conflicts. Major Kenneth A. Segelhorst is a U.S. Army officer currently assigned to the 25th Infantry Division (Light) at Schofield Barracks, Hawaii. He holds a M.A. in Business & Organizational Security Management from Webster University and a B.A. in History from the University of Missouri. His experience includes multiple operational and combat deployments throughout the Middle East and Africa.